Studio Eleven 11: Become an Etsy Tagging Pro with the Site Search Report in Google Analytics! Become an Etsy Tagging Pro with the Site Search Report in Google Analytics! Ah, Google Analytics, or "GA" as I will call it from hereon out. Scary to some, but an invaluable tool for making your Etsy shop more efficient. I know some of you may still be procrastinating on setting up an account. If I'm talking about you, run (don't walk) to your computer and do it. Do it now! Don't know how? Use this Etsy setup guide. Follow it closely as it diverges from the normal GA setup. GA has a lot going on. Being a web marketer by profession, I'd like to share some of the most important things GA has to offer for your Etsy shop. Today I'd like to talk about the Site Search report. 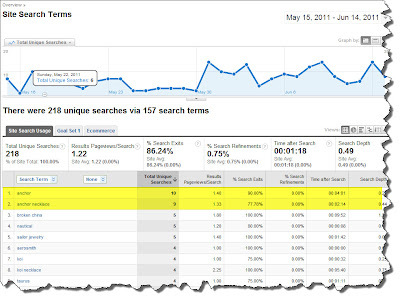 Site Search reports allow you to see how people search your site. You can find out what your visitors search for and which pages they visit as a result. You can also see where they begin their searches, how many pages they visit after searching, and which product groups they are most likely to search. For the Etsy integration, this will tell you which keywords (e.g. tags) are bringing in traffic to your shop!! 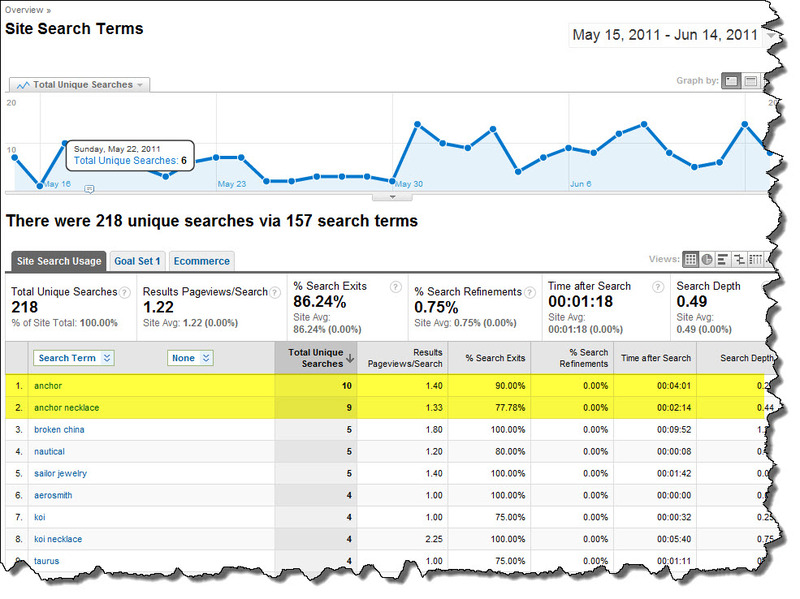 On your main report dashboard, go to Content-->Site Search-->Search Terms. Done! To best use this report, look at blocks of time. Weeks and month(s) work best. What do you see? Any patterns? In the below screenshot (click to enlarge), it's obvious that "anchors" is a hot term right now. So I made sure all my anchor jewelry had this in the tags, as well as the item description. This also tells me that I should consider expanding my items using anchors since its a popular search obviously in high demand. What's also important are the words that aren't here. Take note of the tags not bringing in traffic. These may be keywords that just aren't popular and should be removed to test other keywords that might work better for you. In my example, I might try using colors less often, since despite my heavy tagging, none of my top search terms include a color. Hope this helps & contact me with questions! Get more free online marketing advice for Etsy. Subscribe! It's free, after all. And we all like free. Love it! Thanks for posting in the Etsy forums! Hi Andrea - Just found you in the Etsy forums and am anxious to check this all out tonite when I can better digest, but wanted to say "thanks" for doing this. I know it's going to be a huge help, and your writing style is easy to comprehend. Really glad to find out how the keywords tie in to it all. Much appreciated! You all are very welcome! Just paying it forward, since web marketing is kinda my "thing" by trade. Thanks for sharing :).Great tip, super easy to understand, hoping to play around with it today. Great post - thanks so much. I just enabled site search and I am looking forward to using it. Thank you - once these things are explained they make so much more sense than just looking at the lists!